The Neilmed Sinus Kit Review: The Answer to Better Nasal Health? You may or may not have come across the very strange practice known as nasal irrigation. Nasal irrigation involves pouring salt water (or saline solution) down the nasal cavity until it flows out the other side of the nose. Nasal irrigation uses a device known as a Neti Pot, which is shaped like a little teapot with a long spout. Nasal irrigation promotes good sinus and nasal health. In particular, people have reported it helping in the areas of moistening nasal passages, alleviating colds and allergies, and freeing up congested sinuses. It is for these reasons that this practice of rinsing the sinuses has grown in popularity. Watch the video below to learn additional benefits of nasal irrigation. I’ve been using nasal irrigation to clean my nasal passages for about three years now. In the past, I have always had congestion in my nose, as well as a lot of allergies particularly hay fever. Since I’ve started to rinse my sinuses I would say these occurrences have been dramatically reduced. I notice that I breathe much better through my nose and it feels a lot clearer. I used to breathe more through my mouth than my nose but this has now changed. In addition, I notice that my mouth and throat no longer become dry in the night as I now breathe in air through my nose. Aside from dealing with nose congestion, I just like the idea of having a clean nasal passage! We breathe in a lot of dirt, traffic pollution, fumes, dust and allergens all the time, by using a neti pot it cleanses the nose of these irritants. There are potential dangers of nasal irrigation, and it surprised me to learn that there have been cases where two people have died. In 2011, a 28-year old man and a 51-year-old woman both died (in unrelated incidents) after using tap water infected with the ‘Brain-eating’ lethal bacteria, Naegleria Fowleri. The deadly amoeba is usually contracted from swimming in fresh waters such as rivers and lakes however neither victim had been near any freshwater leading up to their deaths. The only similarities between the two are that they both used tap water in their neti potts. Traces of the bacteria were found in both their home water systems. So how did using a neti pot lead to their death? Whilst tap water often can contain such dangerous organisms, stomach acid usually kills them and stops them from harming the body. The problem is that the amoeba can survive and stay alive in nasal passages. So Is It Safe To Use A Neti Pot? When I first started nasal irrigation via the Neilmed Sinus Rinse Kit, the instructions made clear that you must use distilled, sterile or boiled water. This should avoid any harmful bacteria from entering the nasal passages. Furthermore, the U.S Food and Drug Administration (FDA) has been strict in issuing orders for neti pot manufacturers to issue strict warnings against using tap water. From my research on the dangers of nasal irrigation, I have only found the isolated incidents that took place in Louisiana. Considering this is a practice that is hundreds of years old I wouldn’t worry about the dangers of using a neti pot. Other best practices include ensuring proper cleaning of your neti pot. This means emptying all water and allowing it to dry. Regular cleaning of your neti pot prevents bacteria and germs from growing. This is one reason why I like the Neilmed Sinus Rinse Kit. The units are disposable and after a few months you buy a fresh new kit rather than washing and cleaning the same unit you may have had for years. You still have to exercise basic hygiene with the Neilmed bottle, but it’s good practice to get a brand new unit on a regular basis. There are various ways you can get started with nasal irrigation. You can buy ready-made kits, or make your own saline solution and use your own Neti Pot. 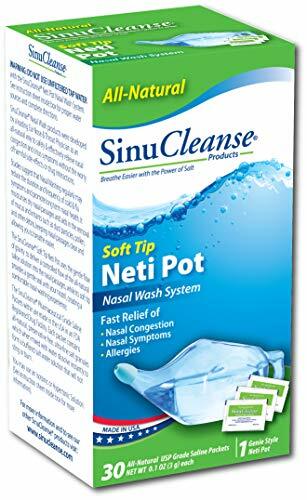 From day 1 I’ve used the Neilmed Sinus Rinse Kit. If you want something quick and easy to get started then this is the one-stop solution. You get one rinse bottle which comes with a screw on cap with a hole on the top, as well as a number of pre-mixed formula sachets. To use the kit, fill the bottle with either distilled, sterile or boiled water (allow to cool before using) and then pour one of the salt sachets into the bottle. Shake the bottle into it’s dissolved. The next step is the weird part if you’ve never done this before. You tilt your head forward and to the side, then squirt water up one nostril by gently squeezing the bottle to generate sufficient pressure. The water shoots up through the hole in the bottle cap and into your nostril. If done correctly the water should drain out the other nose nostril. Now I’m telling you, when you first do this, this is a very strange feeling. It’s like when you go swimming and some water goes up your nose, it’s not a natural feeling. When I first heard about this process something made me uneasy. However, it’s not that bad, and you do get used to the feeling after a couple of days. You’ll find that the benefits of nasal irrigation far outweighs the uncertainty you experience when thinking about doing it for the first time. If you like the traditional Neti Pot and the idea of having the saline solution pre-made the SinuCleanse is a good option too. Whilst I advocate the use of the Sinus Rinse Kit, you can buy a neti pot and make your own saline solution. The video below shows you how to clean your sinuses if you choose not to buy a one-piece kit. Personally I’ve never gone the DIY route as I feel the Neilmed Kit has many benefits which I discuss in the next section. As I said before the Neilmed Sinus Rinse Kit is simple. It’s a one-step solution for anyone who wants to try out nasal irrigation, and has many benefits over traditional methods. Unlike traditional neti pots you don’t have to rely on gravity to allow the water to drip through the correct nasal passages, with the Neilmed Sinus Rinse you can create your own pressure by gently squeezing the bottle which will help deliver the pressure and volume of water you need to clean the passages sufficiently. The bottle that comes with the kit is disposable. After a few months of use you can buy another one to ensure a clean fresh new bottle which is very important when it comes to nasal irrigation as good hygiene practices are required. Another plus is that the Neilmed Sinus Rinse Kit comes with premixed salt sachets. There is nothing worse than having to fumble about trying to prepare your own saline solution every time you want to do a nasal rinse. It’s not difficult to make your own solution, but if you want to make this a part of your regular routine then you want convenience. The sachets are shaped with a narrow opening so it makes pouring the salt into the bottle quick, clean and efficient. Which Neilmed Product Should You Get? Neilmed was founded in January 2000 by Ketan C. Mehta who has since developed the company into the largest manufacturers of saline nasal irrigation systems in the world. They have a vast product range of products to help people deal with common nasal and sinus problems. The Neilmed Sinus Rinse Kit is the most popular Neilmed product, and this is the one I recommend you get started with. To get started you’ll want the basic Neilmed bottle and some premixed saline sachets. You can get this in a number of different combinations. You can buy the Starter Kit which comes with the bottle and 5 premixed sachets. Or you can start off with a larger amount of 60 premixed sachets. Neilmed premix sachets can also be bought separately in refills of 50 or 120 sachets if you already possess a neti pot. When I first started out I used the Neilmed Sinus Rinse Kit five days a week, leaving the weekends free. I’ve since dramatically reduced this number. I now use it perhaps once every two weeks or whenever I remember. Neilmed recommends rinsing daily, however, I’m not sure if this is necessary, I think it depends on how much you need to free up your symptoms. If you’re doing this for basic nasal hygiene and have no nasal issues, then I would imagine once a week is fine. Whilst you will see most demonstrations of nasal irrigation being done over a sink, I do this as I have a shower. Approximately one hour before I plan to shower I’ll boil water and pour it into the Neilmed bottle. By the time I’m ready to shower the water will be lukewarm and I’ll add the sachet solution to the bottle. Should You Buy The Neilmed Sinus Rinse? If you have any of the issues listed above such as hayfever, allergies or other nasal health issues then I do recommend trying out nasal irrigation to see if it helps alleviate your symptoms. It’s also a great way to improve your nasal health and clean out unwanted impurities every so often. 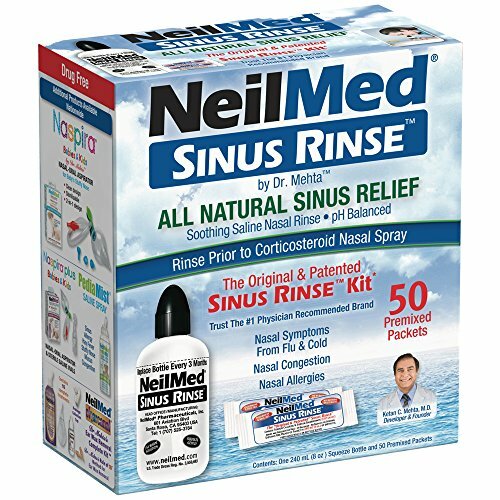 The Neilmed Sinus Rinse Kit is a good product to get started with. It comes with everything you’ll need and you’ll be able to get started right away. I’m sure you’ll notice your nose is clearer and breathing is easier.